The Digilent Design Contest is an international student hardware design competition open to all students who are passionate about electronics: digital design and electrical engineering in general. The competition gives students the opportunity to showcase and improve their technical and creative skills and face new challenges in developing projects using the latest technologies. The contest is open to all level students – Undergraduate, Master, PhD. The Challenge is to develop innovative and interesting projects using Digilent products. Cash prizes will be awarded and all the finalists keep the hardware they received from Digilent for implementing the projects. 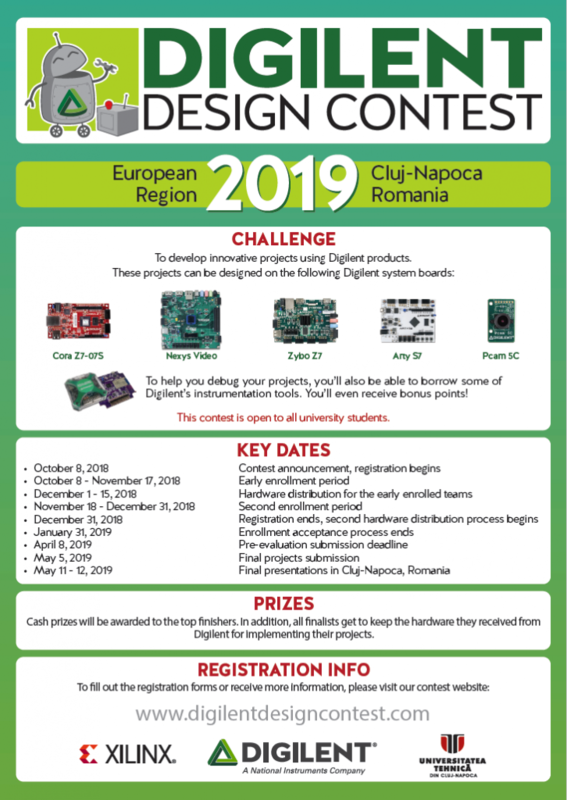 Digilent Design Contest Europe Region has a rich history going into its 15th Edition, with many interesting projects through the years, involving smart and competitive participants, as well as appreciated advisers and students from all over Europe. It is held in Cluj-Napoca, Romania, in May 2019. See the Previous Contests page for editions starting in 2012. The 2019 edition’s registration opens on October 8th. The event is live, with participants presenting their projects in mid-May 2019 in Cluj-Napoca, Romania. Why register for a live competition? Receive Participant Certificates, and Winners Certificates in recognition for your participation.